Marinated portabella and cremini mushrooms in a mascarpone cream sauce, topped with arugula, on a crunchy bit of bread. That’s it. You don’t need much for a sandwich, but it’s tough to put together a genuinely simple one that’s also quite good. With the excellent experience I had the first time I stopped by Little Chef Counter, I decided to see if they were up to the task. I’ll cut to the quick: I was delighted by this sandwich, but I can easily see where others wouldn’t think quite so highly of it. I happen to really love mushrooms, and I’ve got a number of associates who are with me on that. Good mushrooms have a dense, earthy flavor that’s complex and subtle, with a sort of humble richness to it. 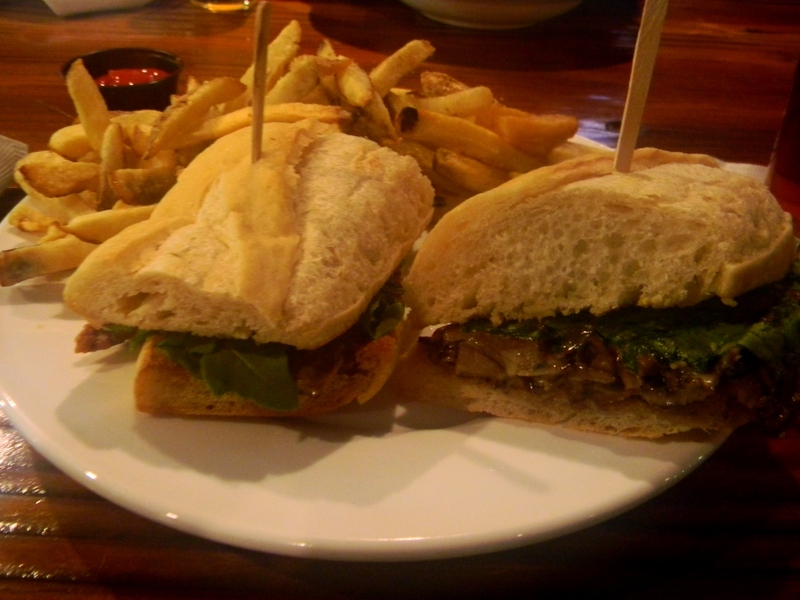 The mushrooms were undoubtedly the star of this sandwich, and their flavor came shining through. The sauce was creamy and boosted the richness, and the arugula gave a contrasting bit of peppery bite. The bread was crunchy, but given that it was stuffed with creamy mushrooms and not much else, a little filling creep was inevitable. Still, it was manageable and well worth the effort. If mushrooms aren’t your thing, then this isn’t the sandwich for you. There’s simply not much else going on; this sandwich is mushrooms for the sake of mushrooms. But if you feel they way I do about mushrooms, there’s everything here to love. Little Chef Counter is two for two as far as I’m concerned, and I look forward to seeing what they come up with in the future. This entry was posted in Sandwich Reviews and tagged Little Chef Counter, Reviews by Pete, San Jose, Sandwiches I Have Eaten, Sandwiches Made For Me, Vegetarian by Pete. Bookmark the permalink.